Can Al Qaeda Survive The Middle East Revolts? Dictators weren’t the only ones caught off guard by the sweep of revolts across the Middle East—so was Al Qaeda. Bruce Riedel on how the revolutions will affect the future of global jihad.As the Arab world undergoes the most profound changes it has seen in over a half century, and the first-ever democratic revolutions in its history, al Qaeda has been caught off guard like everyone else. Now it is trying to regain its footing by looking for ways to gain advantage. So the stakes in Arabia’s earthquake include not just the outcome in each country, the price of oil, and broader regional security, they also involve a battle for the future of the global jihad. The recent uprising in the Middle East has potential to weaken Al Qaeda’s influence. Credit: John Moore / Getty Images; AFP / Getty Images Al Qaeda had nothing to do with the Jasmine revolution in Tunis that began the winter of Arab revolutions, nor did it have anything to do with the Egyptian revolution that toppled Hosni Mubarak. In both cases its various media mouthpieces were remarkably slow to catch up with events. Osama bin Laden has yet to utter one word about the changes in his native Arab world. But time will give it a chance to recover. Egypt especially matters enormously to al Qaeda as the centre of the Arab world—its historic, demographic and cultural heart. How events play out in Egypt will directly impact al Qaeda’s ideology and narrative profoundly. Ayman Zawahiri, the Egyptian number two in al Qaeda, was silent about the revolution that removed his nemesis until last week. He released the first of what promises to be several messages on the revolution through Sahab media (which literally means ‘in the clouds”). In this first commentary Zawahiri only repeated well-worn al Qaeda propaganda. Mubarak was a stooge of the American embassy. The Egyptian state is a creation of western imperialism. The great villain of Egypt is Napoleon Bonaparte! His 1798 invasion was the first plot “to call for the Jews to settle in Palestine,” Zawahiri claims, prefiguring Israel by a century and a half. Al Qaeda urges the complete overthrow of the corrupt Egyptian state, imposition of Islamic Sharia law, and Egypt’s merger into a new caliphate. All of this is old stuff from Ayman (even the charge that Napoleon was a closet Zionist). This probably reflects the fact that what happened in Egypt is a total contradiction of al Qaeda’s ideology and he is playing catch up. For him change in the Islamic world should only come from violent jihad and terror, not broad based popular movements using Facebook and Twitter. Change should also not include the Muslim Brothers, Egypt’s largest and oldest Islamic party, which Zawahiri quit decades ago because it renounced violence. He has written a book, The Bitter Harvest, published in Pakistan on the Brotherhood’s many betrayals of jihad. The book is one of the gospels of global jihad. Now Libya’s dictator Muammar Gaddafi has claimed he is fighting an al Qaeda led rebellion in his eastern province of Cyrenaica. This is a vintage Arab autocrat’s effort to try to smear any opposition as al Qaeda. Al Qaeda’s North African franchise, al Qaeda in the Islamic Maghreb through its al-Andalusia media arm (AQIM demands the re-conquest of Spain for the jihad), belatedly endorsed the uprising in Benghazi and other eastern cities but only days after it started. Again it looks caught off guard. But al Qaeda’s history is one of resilience and adaptation. It will seek opportunity. It has not had a significant presence in Egypt since Mubarak smashed its cells in the 1990s but if the army tries to slow down the process of holding elections and devolving power to a civilian regime, al Qaeda will be quick to call foul. It will argue the revolution has been stolen by a military coup backed by America proving that only terror and jihad can produce real change. In Libya, al Qaeda has long had a larger presence. Its Libyan arm has tried to stage revolts in the past in Cyrenaica. Libya has produced proportionally a larger number of al Qaeda recruits than its small population would warrant. One of the reasons the Clinton and Bush administrations began a dialogue with Gaddafi was because his intelligence services had a great deal of information on the terrorists because many are Libyans. If Libya dissolves into a lawless state with armed gangs of various militias, in effect a Somalia on the Mediterranean, al Qaeda may get a foot hold. But that does not mean the revolution today is our enemy. 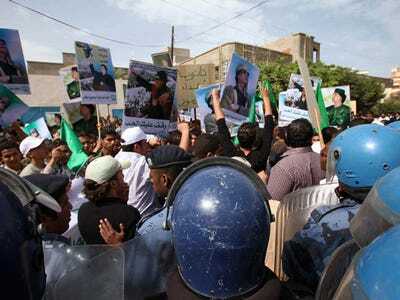 Far better would be for Gaddafi to be toppled and a new regime emerge that reflects a cross section of Libyan society. Al Qaeda in the Arabian Peninsula has embraced the uprising in Yemen but it too is not in the driver’s seat in the demonstrations in Sana or Aden. It will of course benefit from prolonged unrest which diverts attention from counter-terrorism efforts. AQAP has no role in Bahrain where the opposition is predominately Shia, who are by definition anathema to al Qaeda’s Sunni world view. The revolutions in Arab states this winter have demonstrated that the epicentre of al Qaeda’s global jihad has long moved away from the Arabs to Pakistan and south Asia. Aside from its branches in Iraq and Yemen it has been marginalized in the Arab world. Even in Iraq the Muslim Brotherhood has attacked it, and even in Gaza, Hamas has attacked it. It has sympathizers and may yet stage a comeback but for now it is on the margin. Thus these democratic changes have tremendous opportunity to weaken al Qaeda further and deal it death blows in countries where new open societies emerge with responsible democratic processes. In Pakistan by contrast, al Qaeda has a host of allies and fellow travellers. It works very closely with the Pakistani Taliban and with Lashkar e Tayyiba. It has long standing ties to the Afghan Taliban and the Haqqani network. Its leaders still find sanctuary in Pakistan and it helps to murder Pakistani leaders like Benazir Bhutto who fight it. You can’t argue with al Qaeda’s priorities. Pakistan has the fastest growing nuclear arsenal in the world so it makes sense to put your main effort there. This article originally appeared at The Daily Beast. Bruce Riedel, a former long-time CIA officer, is a senior fellow in the Saban centre at the Brookings Institution. At Obama’s request, he chaired the strategic review of policy toward Afghanistan and Pakistan in 2009. He is author of the new book Deadly Embrace: Pakistan, America and the Future of the Global Jihad and The Search for Al Qaeda: Its Leadership, Ideology and Future.